Gaasbeek Castle (near Brussels) presents the exhibition Kairos Castle until June 18th. Guest-curator and Dutch philosopher Joke Hermsen composed the exhibition. Visitors are guided through an exiting tour troughout the neo-gothic castle, where they are confronted with art of the opportune moment (Kairos). Kairos is the Greek God of the opportune moment. Unlike his grandfather Chronos (the time that we have), Kairos represents the inspired moments of beauty and vigour: it is the time that we are. Kairos Castle is almost surreal experience. The meaning of time changes within the walls of the curious neo-style architecture. It seems historical, but something is off. The exibition should be visited with a blank mind. The combination of architecture, visual arts, philosophy and music is surrealistic. Although not all objects are placed well and not all artists are represented with their best works, the total experience is overwhelming and unique. Let go of all traditional expectations and let Kairos Castle surprise you! In Kasteel van Gaasbeek (België, in de buurt van Brussel) is tot en met 18 juni een bijzondere tentoonstelling te zien: Kairos Castle. Gast-curator en filosofe Joke Hermsen stelde de tentoonstelling samen. Via een verassende route worden de bezoekers door het neo-gotische Kasteel van Gaasbeek (nabij Brussel), langs kunst van het juiste ogenblik (Kairos). Kairos is de Griekse god van het juiste ogenblik. In tegenstelling tot zijn grootvader Chronos (de meetbare tijd) is Kairos onverwacht en vluchtig. Hij onderbreekt de meetbare tijd voor intense moment van schoonheid en bevlogenheid. With work by: Maarten Baas, Peter Bogers, Alice Brasser, Mynke Buskens, David Claerbout, Alexandra Cool, Jaap de Jonge, Eric de Nie, Nicolas de Staël, Gilbert Garcin, Antony Gormley, Susanna Hertrich, Rebecca Horn, Marlies Hulzebos, Jay Mark Johnson, Dani Karavan, Evi Keller, Olga Kisseleva in samenwerking met Sylvain Reynal, Jorge Macchi, George Meertens, Corinne Mercadier, Sofie Muller, Otobong Nkanga, Hans Op de Beeck, Thierry Pécastaing, André Pielage, Quayola, Pipilotti Rist, Georgia Russell, Anri Sala, Susumu Shingu, Chiharu Shiota, Marielin Simons, Berndnaut Smilde, Patrick Van Caeckenbergh, Martijn Veldhoen en Antonella Zazzera. Bergarde Galleries is represented at the exhibition as well! 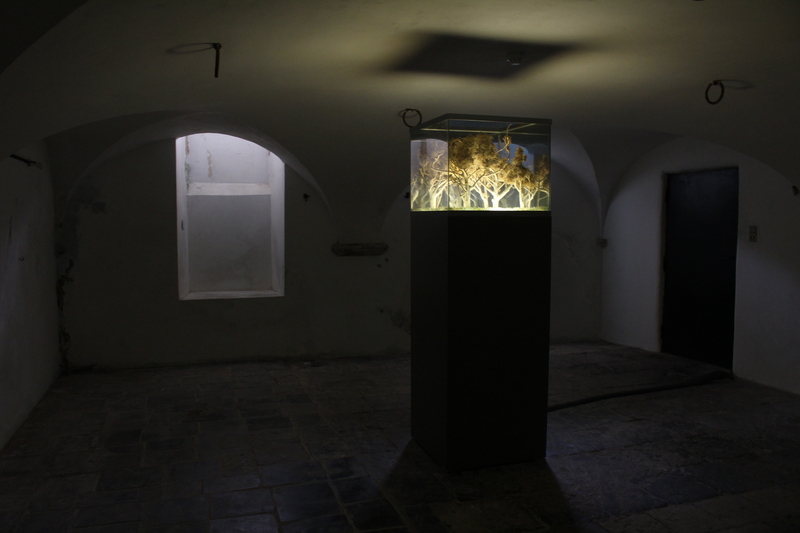 Golden Lane by Marielin Simons (1991) from the Bergarde collection is beautifully placed at the castle’s basement.